The region is home to some of the nation’s most productive forests, and a huge logging industry. In much of North America, especially the U.S. West, climate warming is proceeding too fast for tree populations to adapt, and many forests are declining. Eastern forests, though, are doing well–particularly those in the south-central United States, where temperatures actually have not changed that much yet. No one knows whether this “warming hole” is due to chance convergence of weather patterns or other factors, but the region may soon begin catching up, and the consequences could be immense. Some scientists believe that many common tree species here could be more vulnerable to warming than other trees in the Northern Hemisphere. Some dominant species may die off, while others may do better. Forests may shift composition, changing both economics and ecosystems. In some areas, forests could simply disappear, and release large amounts of carbon into the atmosphere, further warming the planet. 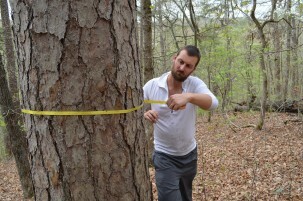 To get at what the future might hold, Williams had come with a small crew from Columbia University’s Lamont-Doherty Earth Observatory to sample trees’ yearly growth rings. A wide ring generally signals a good growth year for the tree, while a narrower one means a worse one. The researchers can then correlate the rings to instrumental records showing when temperature or rainfall spiked or dropped. This should allow them to understand how various species have reacted to year-by-year weather variations—and hopefully to project how they will react to longer-term changes in overall climate. Technician Javier Martin Fernandez drills into a white oak in order to sample a cross-section of its rings. Tree-ring scientist Neil Pederson, a Lamont adjunct based at Harvard Forest, notes position, surrounding trees and other data. Forests cover some 20 percent of earth’s non-glaciated land, and scientists worldwide are asking the same questions. In many places, they see forests already changing. The news is often grim for species that have dominated regions for thousands of years. Long-term increases in heat have been aggravating droughts that starve trees of water—often the main factor controlling growth and survival. In recent decades, drought has decimated firs in Turkey, acacias in Zimbabwe, eucalyptus in Australia. “A tree can notice even a 1-degree increase in average temperature,” says Williams, who recently published a widely noted study showing how global warming has worsened an ongoing drought in California that has killed tens of millions of trees. Currently, water stress is wiping out ponderosa pines across much of the U.S. Southwest and aspens in Colorado. Higher temperatures and aridity are helping drive wildfires that took out more than 3 million acres of U.S. forests in 2014 alone. In California, drought and wildfires could kill off some 120 million trees—maybe 20 percent in the state—in coming years. The vast evergreen boreal forests reaching up into arctic Alaska and Canada are also browning, and burning. In the U.S. East, invasive woolly adelgids, insects that specialize in sucking the life out of common hemlocks, are spreading about 15 kilometers a year, because winter cold that used to kill them is abating. Bioclimatologist A. Park Williams extracts a core; the size and density of rings will tell him how the tree has reacted to past weather swings. What will replace once-dominant trees? Northerly black spruces and other evergreens may give way to southerly deciduous trees. In California, various species might march uphill to escape heat; ancient sequoia forests may change to ponderosa pine or oak, while the lower-elevation oak forests might become grasslands. In the fast-warming U.S. Midwest, common maples, birches and beeches are projected to decline during this century, but what will come next is not clear. In drier places such as the U.S. Southwest, forests may soon stop being forests, and become drought-adapted grass- or shrublands. Pine and fir forests that dominate the U.S. Northwest may become scrubby chaparral. In every case, entire ecosystems will likely vanish, to be replaced by new ones. “We want to know who will be the winners and who will be the losers,” said Williams. In rural southern Missouri, the scientists drove on back roads through miles of piney woods, punctuated mainly by deserted-looking cabins, small Baptist churches and cattle pastures. Turning off on a rough dirt track, they drove to the end, then hiked a half hour up and down a series of heavily wooded ravines to a target area that had been identified by state foresters. The urgent, stuttering cry of a pileated woodpecker echoed through the trees. “There’s our friend,” said Neil Pederson, a tree-ring scientist from Harvard Forest helping run the expedition. The big woodpeckers prefer big old trees, and so do tree-ring scientists. The cry meant the team was on the right track. Sure enough, a stand of scattered 100-some-year-old shortleaf pines and other big specimens came into view. The scientists got out their tools. Trees like this big shortleaf pine grow straight and fast, and are mainstays of the timber industry. How they might do in a warmer climate is an open question. 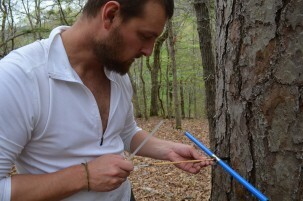 Sampling a tree involves hand-screwing a long, hollow drill bit into the trunk. As the bit digs in, it takes in a straw-width cross section of each yearly ring, from the most recent outside one, back to the interior, when the tree was a sapling. It is a harmless pinprick for the tree, but tough on the samplers; getting the corer to the center of a solid two- or three-foot-wide tree takes muscle and persistence. The four-man team deployed to different trees, and soon were sweating and panting. Moving through seesaw terrain, they went at it for hours, carefully measuring each tree, and logging exact GPS coordinates. 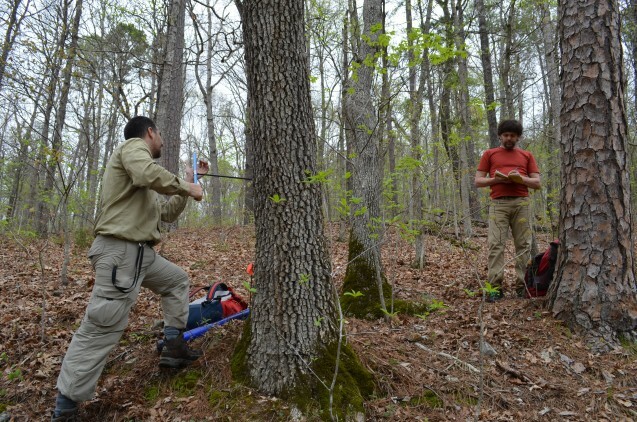 By day’s end, they had sampled dozens of pines, walnuts, oaks and other species. The cores were packed into a tube for later analysis at the Lamont-Doherty Tree-Ring Lab. 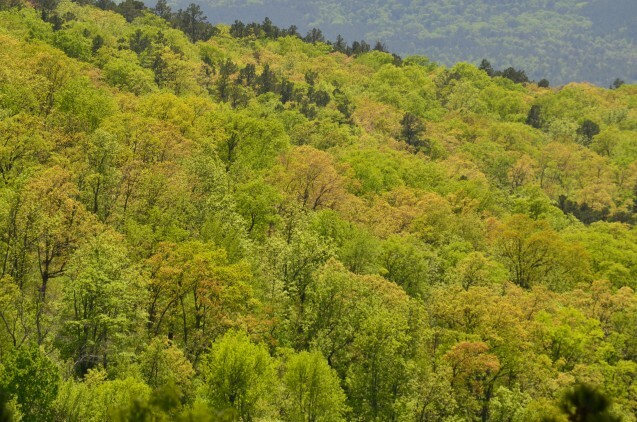 Forests in Arkansas’ Ozark mountains tend to be a mixture of deciduous and conifer trees. Species compositions could change in the future. 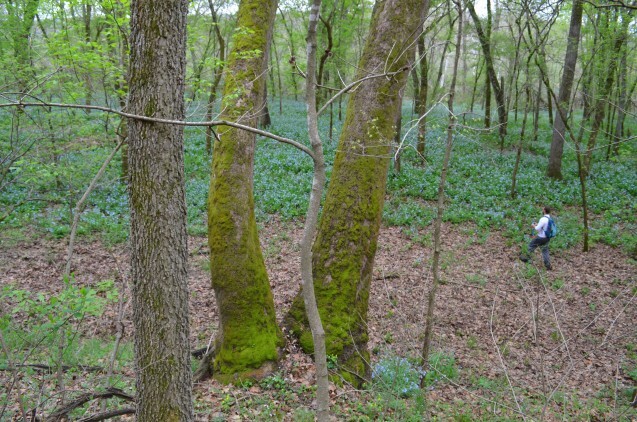 Williams suspects that some trees here might expand their reach as climate warms. These include scrubby, drought-adapted post oaks, now confined mainly to drier upland terrain where they don’t have to compete with trees that require, and get, a lot of moisture. The ones that might suffer include the magnificent black walnuts, which prefer lower, wetter areas, and may grow to great size. The post oaks are not commercially valuable, but the walnuts are—so much so that bandits have been known to cut down inaccessible specimens and airlift them out by helicopter. White oaks and red oaks, used for flooring, cabinets and furniture, dominate large areas; they may not do so well, either. In fact, a brief but intense drought in 2011-12 killed as many as three-quarters of the white oaks in some areas. It is also unclear what might happen to the common tall, straight yellow pines—the basic stuff of 2-by-4s and paper, which are exported far and wide. The various species of hickories, maples, ashes, magnolias, beeches and other trees common to this region could go either way. Logging has long been the lifeblood of many towns here. 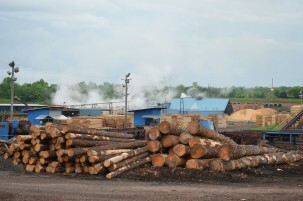 An Arkansas mill converts pines into lumber. As you travel further west through Missouri and Arkansas, you drop out of the relatively rainy mountains into the flatlands of north-central Oklahoma. Here, the climate is drier, and it shows; the thick Ozark forests peter out into rolling grasslands. You are no longer in the backwoods, but at the edge of the Great Plains, where horses roam in the open, and the skeletons of dead or dying towns dot the landscape. As climate warms, this kind of landscape may start creeping east, says Williams. A couple of days into the expedition, Williams was already coming down with a nasty, bright-red case of poison ivy on both arms—probably the result of coring, measuring and otherwise tussling with trees covered with the venomous vines. As for snakes, locals had half-joked that the team would witlessly step over far more than they would ever notice. Toward the end of the trip, the team was walking through broken blocks of bedrock next to a stream. Two of them stepped over a snake without seeing it, and the third, a Lamont technician, noticed it—what looked like a canebrake rattler, coiled on a rock. The snake quickly retreated into some short vegetation.